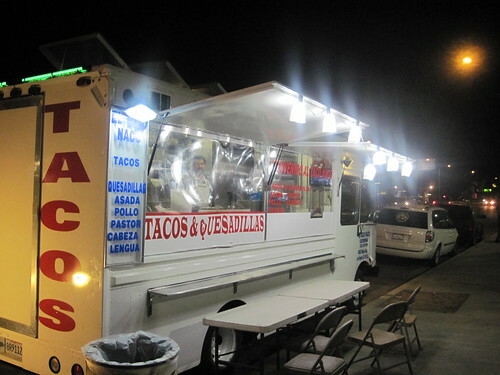 No matter what time of day you are on York Blvd you can get a good taco. It’s where you’ll find the El Pique and La Estrella corner that has been slinging reliable bombs of flavor for as long as I can remember. 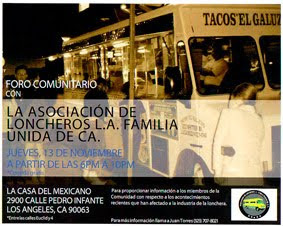 The competition heats up on the weekend with the taco tables and I’ve been noticing a lot of new flavor on the block lately with a Birria wagon that parks about 2 blocks east of La Estrella and a couple new (well new to me) taco wagons that have been plying their trade in this unofficial taco capitol of Los Angeles. El Taco Naco may have the friendliest taquero out of all of them. Our man seems to have always have a smile on his face and even comes out to the table to personally ask you how your enjoying your tacos (well he did to me! Maybe he knew I was a taco reporter?) . The tacos don’t quite have the greasy goodness of flavor that you’ll find at La Estrella or El Pique (if I’m hung-over it’s El Pique or La Estrella for sure) and the tortilla suffered from a little dryness but overall these were quite good. The carne asada was thicker in texture and had some nice flavor to it and the al pastor not from a vertical spit but about as good as one can expect sans the rotisserie. The salsa roja is ladled on top of a healthy bed of cilantro and has a peppery spiciness that peaks after a few seconds then starts to fade. El Taco Naco comes out evenings and stays out as late as 2am. 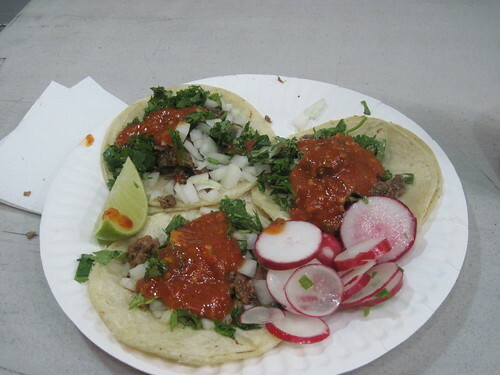 Would El Taco Naco be my first choice in Highland Park? Probably not but they would definitely be included in a taco crawl.